It was fall, 1974. I’d just turned 15 and, while I’d seen a lot of the Santa Lucia backcountry, I’d never been to The Window. La Ventana, the high notch in the ridge west of the Ventana Double Cone had the reputation of being the ultimate Santa Lucia destination. After all, it was where the hardest core Sierra Club old-timers held their secret conclaves. It was where de Angulo’s Sureños went seeking power. It was the reason the whole place was called the Ventana. I was desperate for a chance to go there. Then, at school, I chanced to meet a fellow student named Fred Miller. He was 16; a year older than me. He told me he’d been to The Window and knew the best ways to get there. He’d first gone as part of some kind of semi-militaristic Boy Scout ordeal-in-the-Wilderness program, but it was clear he’d fallen deeply under the spell of the Ventana and was no longer fit for anything as regimented as scouting. In fact, from the far off look in his eye and his oddball dress and manner, it was obvious that, to a degree quite unusual for a person his age, he was singularly unconcerned with what anyone thought of him. 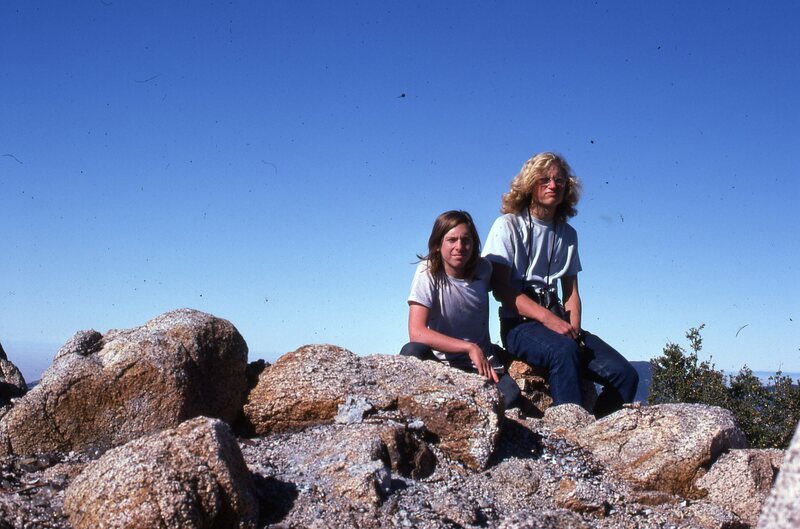 He would go on to lead a bicycle-centered, car, alcohol and drug-free lifestyle and to gain notoriety and brief national attention for climbing Mt. St. Helens while it was actively erupting – and shortly before its cataclysmic explosion – because “you can’t believe what you see on TV.” He barely escaped with his life from that adventure, groping blindly through the woods with his all-important glasses smashed and his clothes and hat burned full of holes. But that’s a different story. I was all for heading straight for The Window at the first opportunity, but Fred had a better idea. He wanted to climb the sheer south face of the Double Cone. 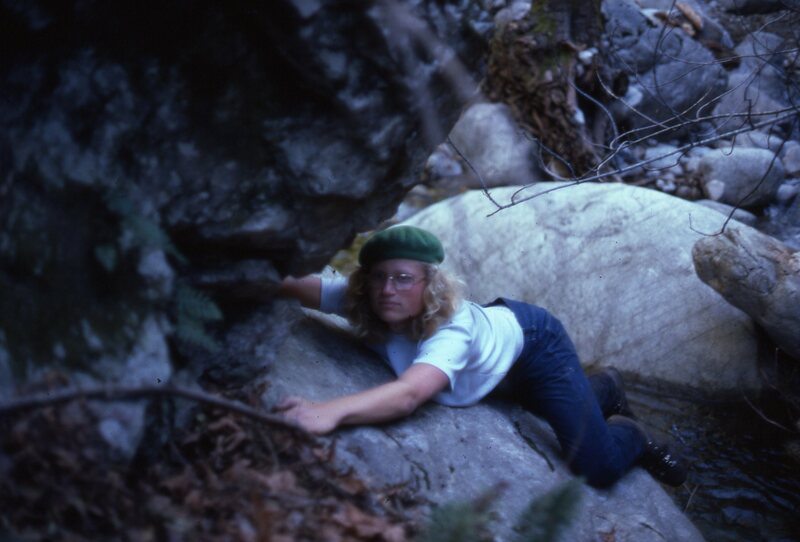 He knew I was a rock climber and had climbing equipment, so he laid out the following plan: We would wait for a three-day weekend a few weeks away, then I would bring my rope and rack of gear and we would hike the five miles up to Ventana Camp, on the Big Sur River, after school on Friday. 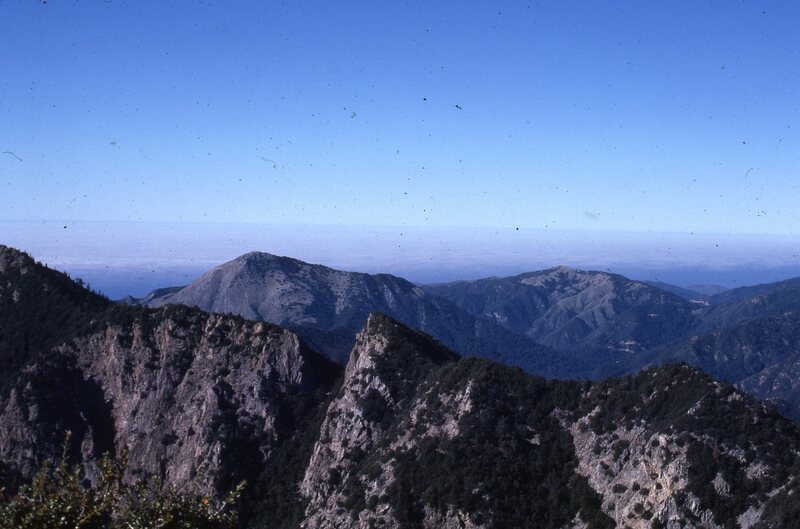 Saturday, we would traverse cross-country up Ventana Creek to the foot of the Double Cone’s south face, climb it, and spend the night in the cabin on the summit. 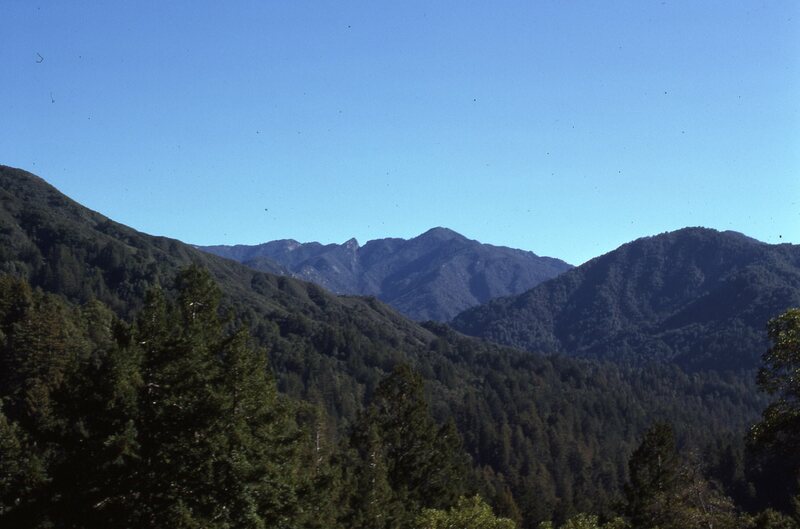 Sunday we would fool around in the high country, traversing to The Window and then descending to Jackson Creek and Fox Camp, on the Little Sur River. Monday would be an easy walk out to Bottcher’s Gap. I was nervous. I respected Fred’s age and experience, but I knew he didn’t know much about climbing. I had seen the Double Cone’s south face from afar and it looked big and serious. Yet, chances were, if the rock were reasonably sturdy it would be possible to find a way up it without any need for actual roped climbing. If we did have to resort to full-on rock climbing, that would take some time. I was skeptical about getting all the way up Ventana Creek plus pioneering a multi-pitch rock climb in a single day. And what if the climb turned out to be really hard? Or the rock turned out to be rotten? Knowing how to rock climb wasn’t the same thing as being good at it. 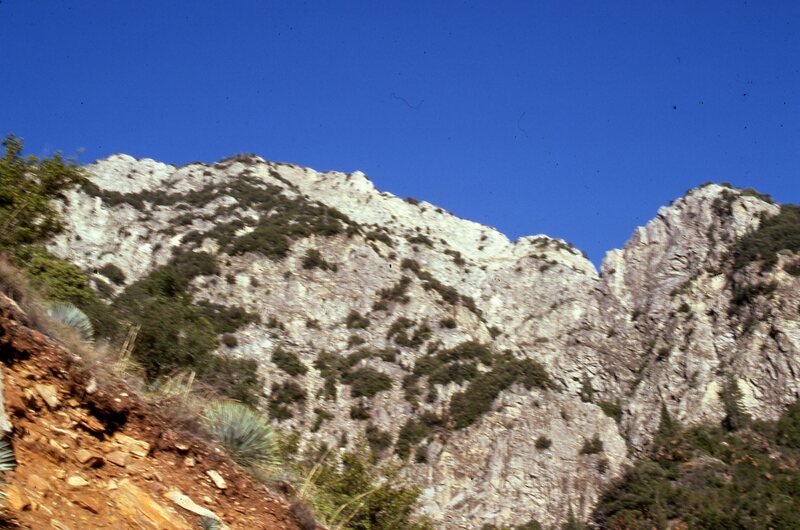 I would have preferred to leave the climbing equipment at home and avoid technical terrain – avoid the whole south face of the Double Cone, if necessary. 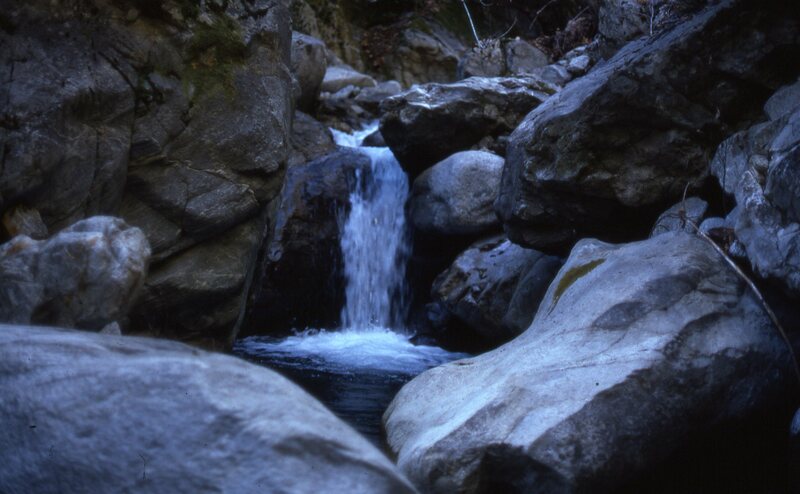 I did have some experience with Ventana Creek. 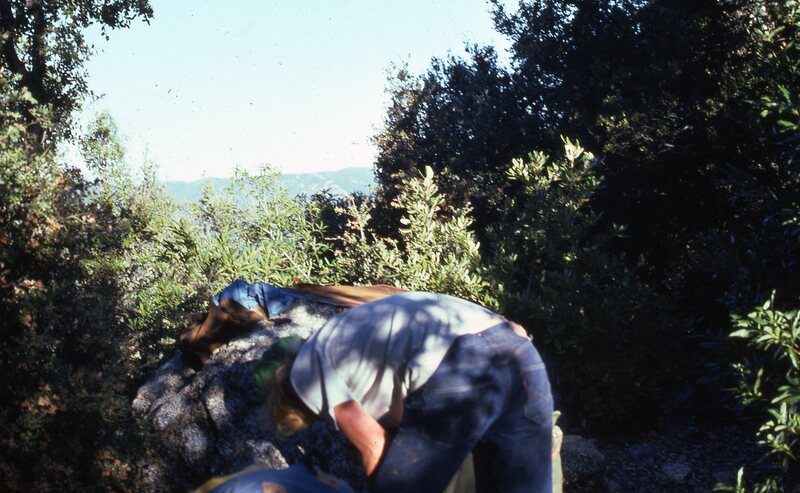 I’d been a good ways up it a few years before, on a day hike out of Big Sur with botanist, G. Ledyard Stebbins, and Ventana backcountry legend, Al Kandlbinder. I remembered the going being kind of slow. With full packs and climbing gear it would be even slower. Night after night I lay in bed poring over the topo map, running my finger over and over the twisting, steeply climbing line of Ventana Creek, and trying to guess how long it would take; then staring at the tightly packed lines that denoted the Double Cone’s face as if willing some route to reveal itself. Back at school, when I tried to discuss my concerns with Fred, he dismissed them out of hand. He was the picture of confidence and calm. It would be no problem, he assured me. He knew exactly where and how we would make our ascent. The appointed day finally came. My Mom dropped us off mid-afternoon at the Pine Ridge trailhead in Big Sur. She would pick us up mid-afternoon on Monday at Bottcher’s Gap. In addition to a bunch of heavy climbing equipment, I was also carrying a brick-like Nikon F and a few rolls of Kodachrome 25. Without a tripod, photographic subjects would need to be fairly bright, but at least the weight made it possible to hold the camera pretty steady. Looking back at Big Sur from the Pine Ridge Trail. The sycamores had already lost their leaves. 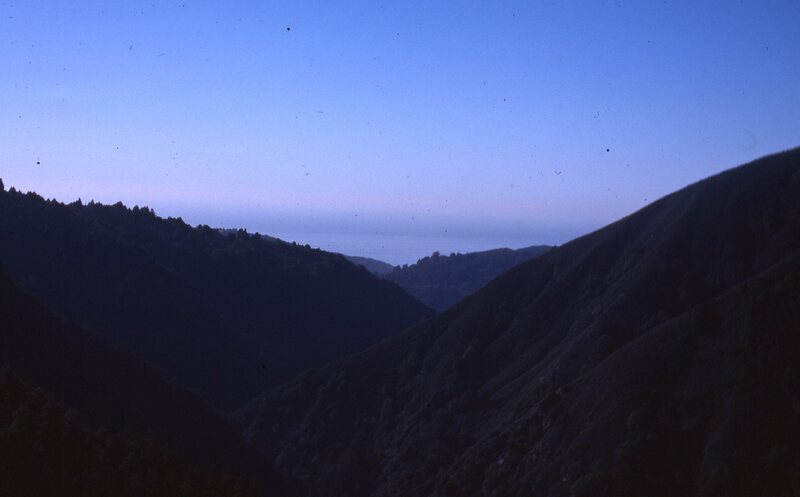 Late in the afternoon: Looking back down the Big Sur Gorge. Arriving at Ventana Camp, we took an invigorating dip in the big bedrock pool just downstream, letting the current spin us through the narrows. While we were swimming, another traveler pulled into camp. He was skinny and dirty, with guns, knives and fishing gear strapped all over his raggedy clothes. Speaking in a strong southern accent, he informed us he had been out for a week already “living off the land.” Running from the law looked more likely. Wanting to be charitable and, if truth be told, a little worried that he might otherwise go crazy from hunger and attack us, we offered him some of our ample meal, but he politely said he “couldn’t possibly” take our food. He did, later, wolf down some nuts and raisins we passed around the fire, which let us sleep a little easier. We awoke in the morning to find our neighbor in a rage. Someone had stolen his half jay, which he’d left on a rock near the fire. I told him the culprit was likely a raccoon, and this news, unexpectedly, cheered him up. I was weary of his company and feeling pressured by the enormity of our schedule for the day, but Fred remained relaxed, insisting on slow-cooking a pot of oatmeal and otherwise behaving as though we had all the time in the world. 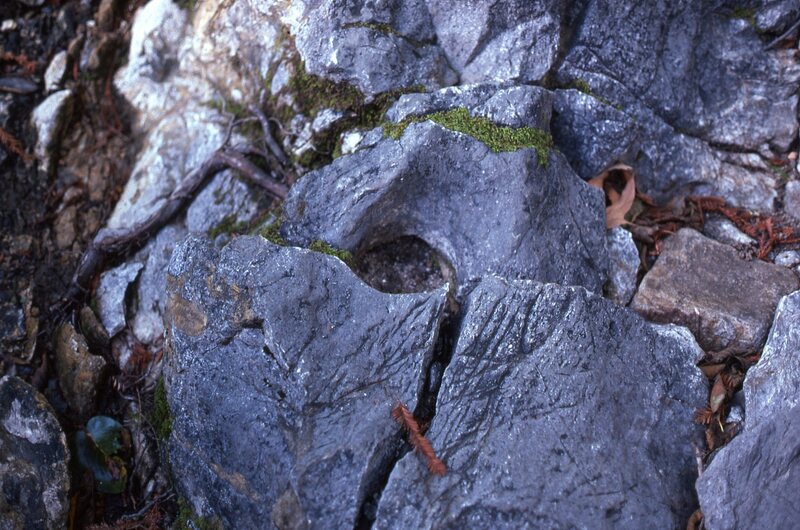 While Fred worked on breakfast, I wandered around and photographed an old bedrock mortar. Apparently, people have been enjoying Ventana Camp for quite some time. It was a relief to finally ford the river and get the day underway. Once on Ventana Creek, the peace of the wild quickly settled around us, and it was hard to feel worried or pressured anymore. I still wanted to maintain a good pace, but Fred, although he was plenty strong, simply wandered along drinking in the scenery, and smiling, Cheshire Cat-like, at everything he saw. I had plenty of time to take pictures while waiting for him to catch up. The going was pretty much as I remembered it. Not too difficult, but not too conducive to getting anywhere quickly either. We passed our packs across before making this move. At one point we tried to climb around a gorge to avoid having to wade and, after a long climb, found that the way wasn’t practical. Normally, in such a circumstance, we’d have had to retrace our steps and then wade or find another route. 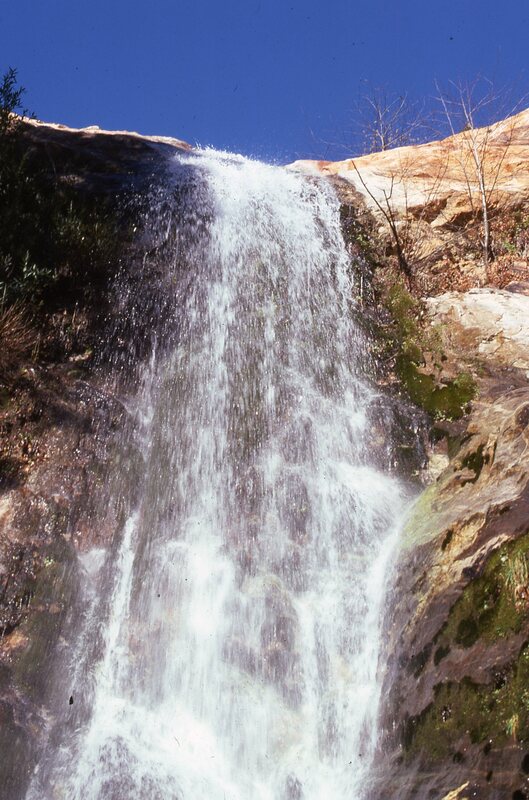 But, thanks to having a climbing rope along, we were able to simply rappel into the gorge upstream of the pool. Now, I told myself, even if we didn’t end up climbing the south face, carrying the rope hadn’t been a total waste. We stopped for lunch in a redwood grove across the stream from a remarkable formation of granite (which there was no good way to photograph). Could this have been the place where Jeffers camped? Probably not, it sounds from the poem like he was further upstream. Maybe at the foot of the south face itself. The canyon wall to the left looked like the easiest way around and I began to think that maybe, given the lateness of the hour, we should start up that slope and just keep going, avoiding the Double Cone’s South Face and heading straight for The Window, or at least The Window’s general vicinity. I was afraid Fred would insist on sticking to the original plan, so I didn’t say anything about my thoughts … but I did fill my quart water bottle before we started up the hill. The mountainside was incredibly steep and the rock was incredibly rotten. If it hadn’t been heavily forested, it probably wouldn’t have been climbable. We were pulling ourselves up by the vegetation, while the rock crumbled away beneath our feet. I kept expecting Fred to insist that we traverse back to the stream, but he toiled along behind me saying nothing. 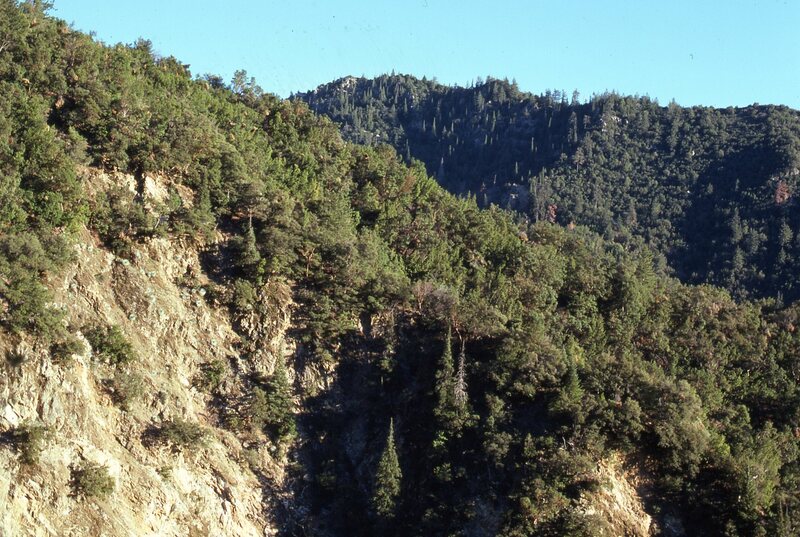 Wilderness heartland: Looking back across the canyon, as we emerged from the gorge. The moon appeared through a notch. 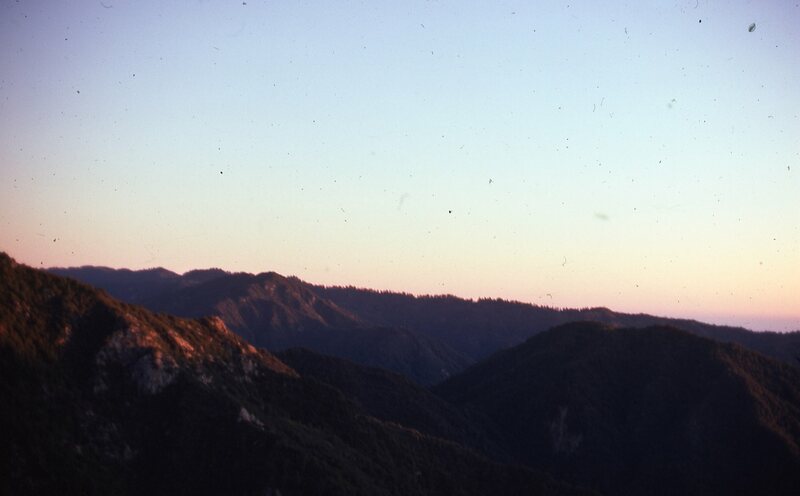 Looking back toward the Coast Ridge (with Olmstead and Island Mountains in the foreground) at sunset. 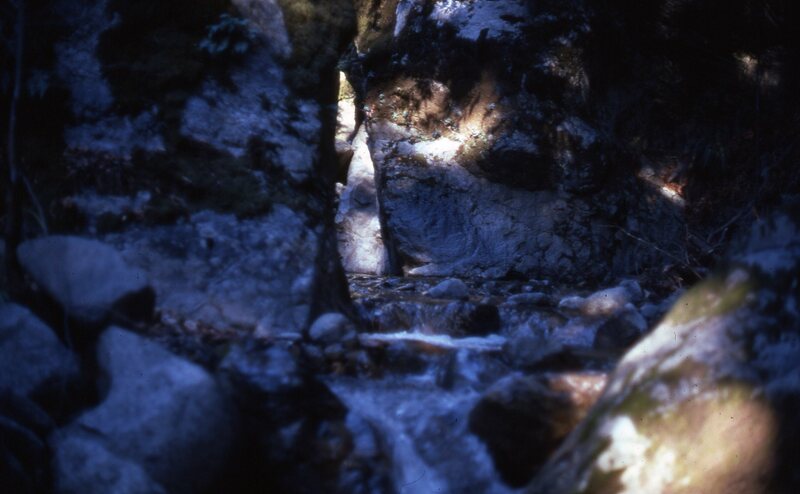 We were scrambling up the side of Peak 4653 (now Kandlbinder Pk., but known in those days only by its elevation) and we were running out of light. It was getting too dark to safely continue, but there was no good place to stop. We finally found a narrow sloping ledge and decided it would have to do. Sliding off in a sleeping bag was a stomach-turning thought and looked all too likely on our slippery ledge, so we broke out the rope, anchored to a stout manzanita fifteen feet above us, and tied ourselves in for the night. We shared small sips from my water bottle, ate some salty jerky and dry Wyler’s Lemonade mix (a staple of my backpacking kit in those days) and watched the stars wheel overhead. A dim light twinkled in a cabin on the Coast Ridge – the only sign of human life. 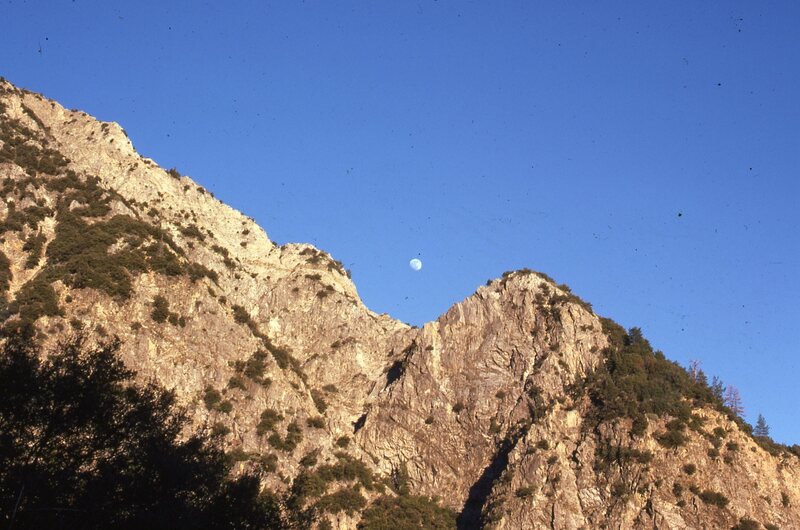 I drifted off to sleep watching the moonlight wash over the looming, and thankfully unclimbed, face of the Double Cone. We didn’t linger. As soon as it was light enough to see we were up and on our way. But not before polishing off the last few sips of our water and eating some more jerky and dry lemonade mix. We made short work of the rest of the climb and were soon on top of Pk. 4653. From there it was a simple matter of crashing through a few fields of brush to reach The Window. I’d finally made it! 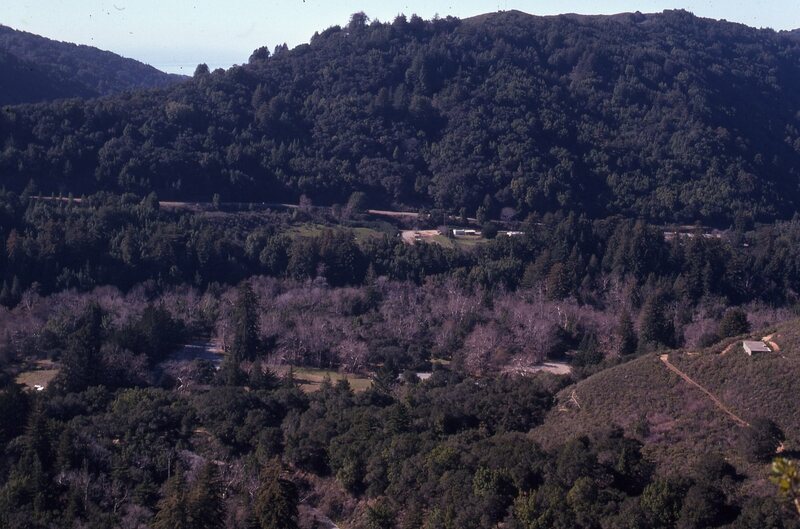 Fred said there was a spring a quarter mile or so down the chute dropping into the Little Sur from The Window, and, as we were both intensely thirsty, I kind of thought maybe we ought to head on down there. Fred was against it. He said we might as well drop our packs and traverse over to the summit of the Double Cone and back first. After all, it wasn’t very far. 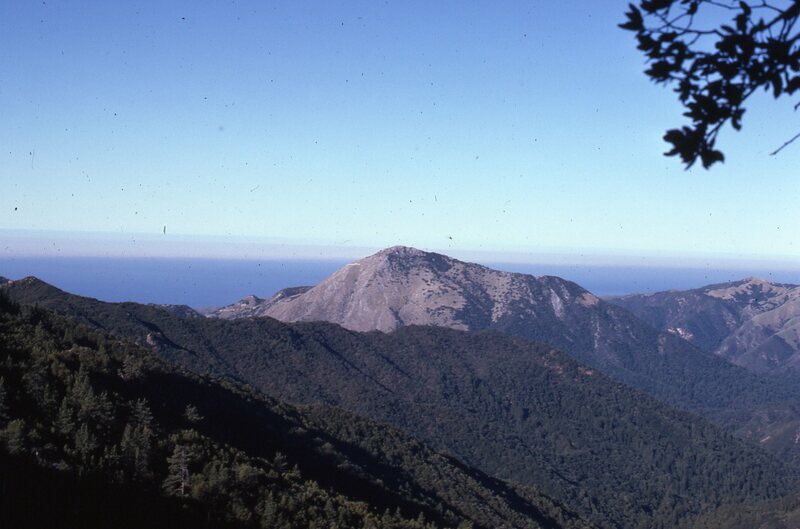 View of Pico Blanco from near The Window. Jackson Creek drainage in the foreground. There was a trail in those days from The Window to the Double Cone. Not a trail in the sense of having a trail tread, just a very cleverly worked out route through and around the rough terrain, where brush was cut back wherever necessary, just enough to let you pass unscathed. No ribbons festooning the brush, no cairns. It was like cross-country travel where a clear route always seemed to magically open up in front of you. The best Santa Lucia ridge walk I’d ever been on – except that it was hot as hell and I was dying of thirst. I set the camera on a rock for an official summit portrait. If we look a little hot and dehydrated, it’s because we were. View of The Window, Pico Blanco, Bixby Mountain, Bottcher’s Gap, etc. from the summit of the Double Cone. On the way back to The Window, the heat and thirst became even more intolerable. Fred began stumbling into rocks and trees and I wasn’t feeling any better. I don’t remember how we got our packs and slid down the scree-filled chute toward the water. But I do remember my first sight of the spring; that small, improbable pool of cold, clear water in the middle of a sea of rock. Fred, dredging up his Boy Scout lore, advised that after going so long with so little we should drink only a cup or two to avoid getting sick. I was having none of it. While he sat on a stone sipping abstemiously, I drank deep, long draughts straight from the spring, then mixed a quart of lemonade, drank it, mixed another and drank it as well. And I never felt better in my life. 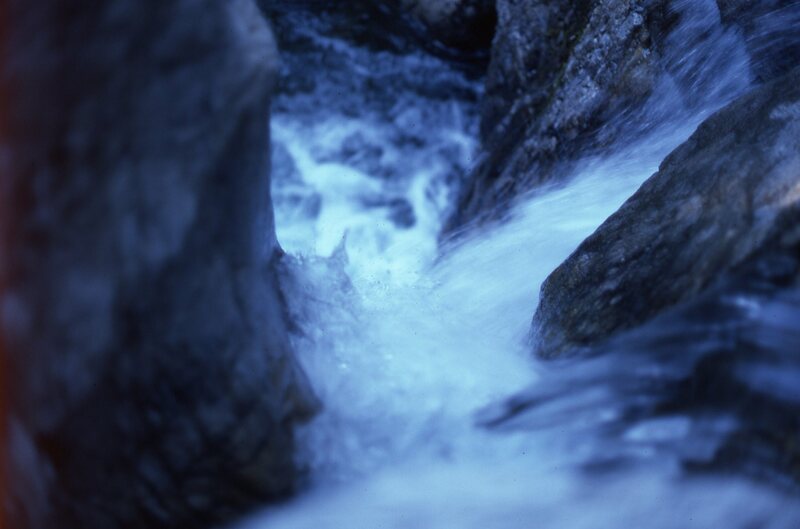 From the spring, the route crossed a spur and descended to Happy Forks on Jackson Creek. I had no idea and was completely unprepared for what I was about to see. Like the unofficial trail between The Window and the Double Cone, the unofficial trail down Jackson Creek to Fox Camp on the Little Sur River was a minimalist work of art. Just enough work to create an easy passage, never enough to scar the landscape. And what a landscape! I thought I’d seen beautiful places before, but this was a place apart. 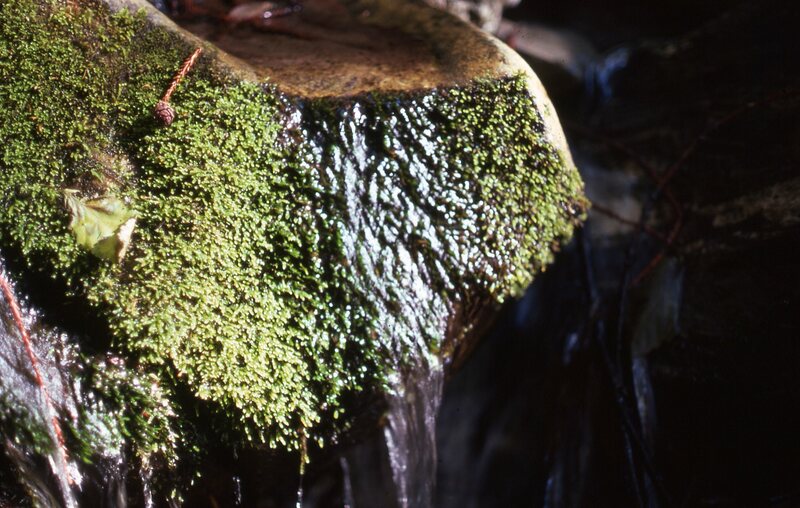 The stream flowed from bedrock pool to bedrock pool across the open floor of a cathedral redwood forest. At one point the trail ran straight through an enormous hollow redwood. At another place, a large burl protruding from a fallen log was shaped exactly like a statue of the meditating Buddha. It was covered in lush green moss and standing in a shaft of light. We pressed on. The hiking was effortless. My pack and body seemed to have no weight. There was no sense of time or distance. Just the sun drawing water into the canopy overhead; the stream gliding over polished marble; the blood flowing beneath my skin; the voices of the birds and the humming drone of the insects. The color spectrum refracted on a strand of spider silk drifting through dappled light. Water and light, water and light. The forest straining and bursting with ecstatic life. So many, many forms of life, but all part of the one life. Water brought into motion by the power of the sun. And beneath it all, the slow, steady pulse of the earth itself. Walking in this exalted state, we followed the sliding water ever downward until we, and it, arrived at the Little Sur River. 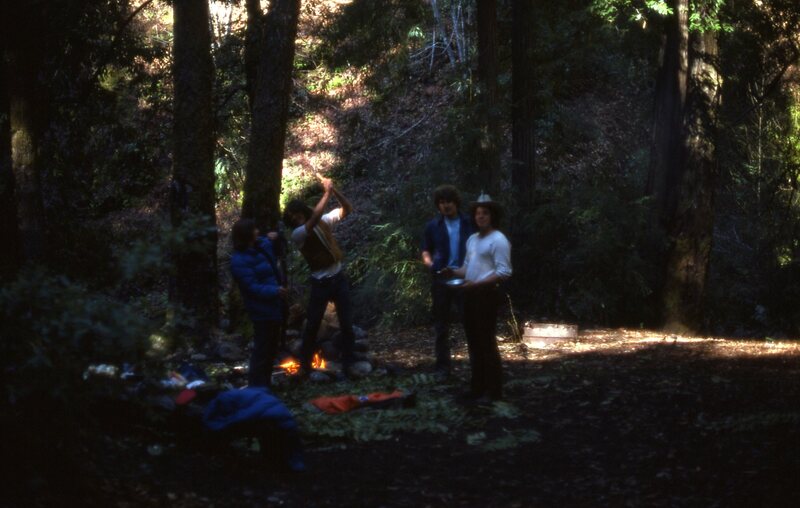 Fox Camp; a spacious redwood shaded flat, sat at the confluence. After a relaxed breakfast and a side trip to swim in the first circular pool, we headed downstream. Sadly, we saw no naiads, on this trip, but as this photo indicates, that’s not always the case. 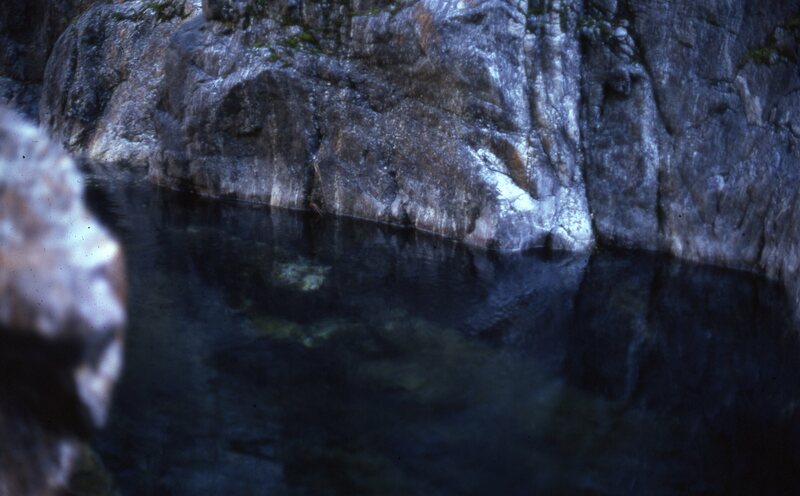 Naiads frequently tempt travelers to bathe in the enchanted waters of the pools. At Fish Camp we met the first human beings we’d seen since leaving Ventana Camp; a bunch of guys we vaguely knew from school. They cautioned us that the short trail back to the Scout Camp was hard to follow. They’d gotten lost on the way in. After the distance we’d traveled with no trail, we weren’t too worried. They were curious about where we’d been, since they didn’t know there was anywhere to camp further up the river. We told them about Fox Camp. We didn’t even bring up Ventana Creek and The Window. There wasn’t any point. Needless to say, we found the trail back to the Scout Camp as easy to follow as a paved road, and we were quickly up to Bottcher’s Gap. Looking back across the Little Sur at the Double Cone, Window, and Kandlbinder, while on the climb to Bottcher’s Gap. Following this trip, Jackson Creek and The Window became my favorite Ventana destinations and many excellent adventures followed (including one where Fred accidentally set fire to his only pair of socks during a snowstorm on the summit of the Double Cone). 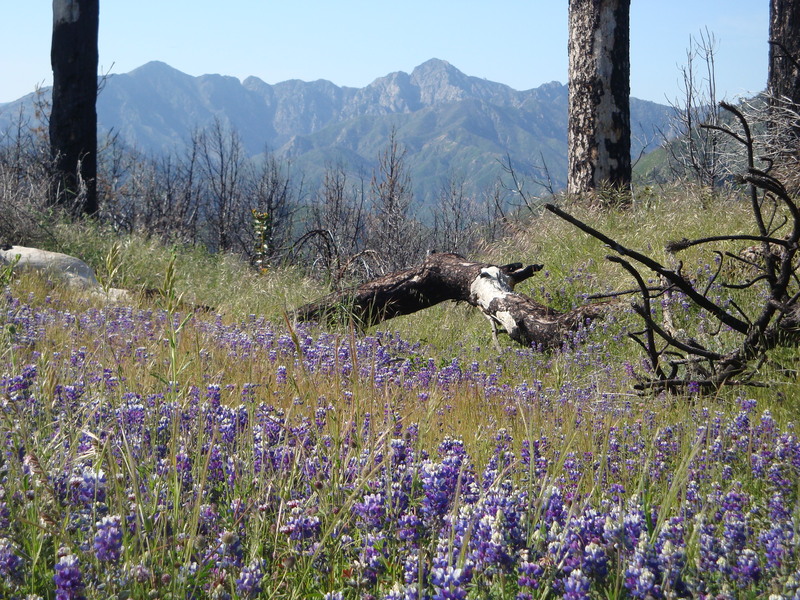 Unfortunately, Jackson Creek was severely burned in the Marble-Cone fire, then deeply buried by debris flows. 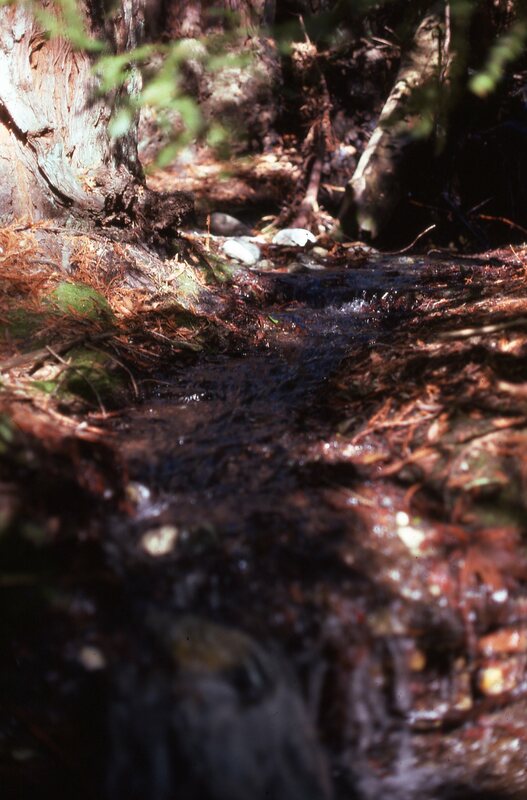 The bedrock granite stream surrounded by open redwood forest is only a memory today, although many big redwoods remain. This entry was posted on Saturday, November 3rd, 2012 at 12:06 pm and is filed under Big Sur, On Foot, Santa Lucias. You can follow any responses to this entry through the RSS 2.0 feed. You can leave a response, or trackback from your own site. Wow … what an adventure! Thanks for sharing the story and your wonderful photographs. At last report, Fred was still living somewhere in the Seattle area. We hear he rides his bike down to the Monterey Peninsula once in awhile to visit his parents.